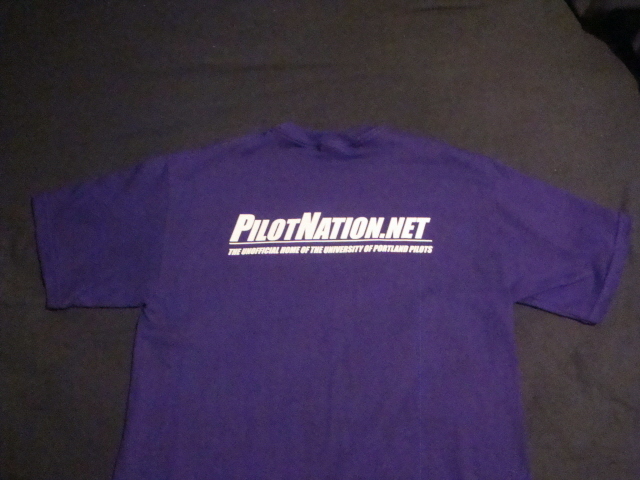 The long-awaited Pilot Nation T-shirts are here! The shirts are being sold at cost, for the bargain price of $10 each. This is no cheap, paper-thin t-shirt, either! 100% cotton, pre-shrunk "Ultra Cotton" Gildan shirts here... they will last. The shirts will be available for pick-up in person on Friday, 10/23 prior to the SMC WSOC game and in conjunction with the men's basketball season ticket event on 10/24... specifics to be posted later. Please, if you are local in Portland, plan on paying and picking up in person... I am doing this out of my own pocket on my spare time! For those of you who are not local, we can make mailing arrangements. Edited to add: Oh yeah, and you can update your email address in your profile by clicking on "Profile" at the top of every page, just below the banner. Very cool. I'll place an order very soon. If you would like to order a shirt or find out where to get one, and are not a member of this site, you can send an email to pilot.nation@yahoo.com. Saturday, 10/24: I will be at the basketball event by 5:30pm when it starts... I do not know the set-up, but I will try to hang out near the main entrance or where ever they are handing out the season tickets; look for the tall guy in the subject shirt, with the Rubbermaid container. Please have $10 cash per shirt. Thanks! Do you have one in Gore-Tex with hood and matching rain pants for tonight's game? 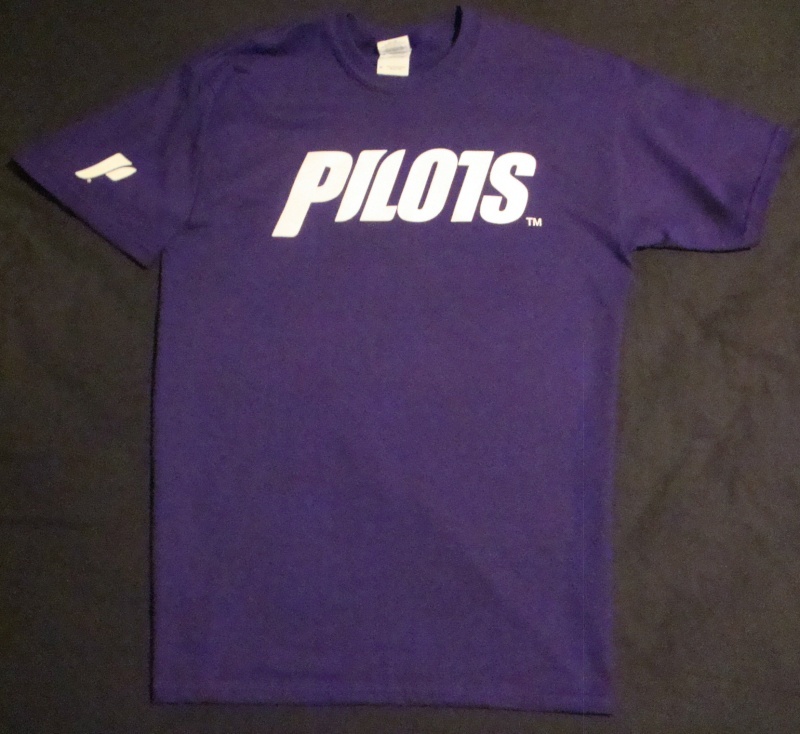 Thanks for outfitting Pilot Nation in style. Excellent shirt, PilotNut. A side benefit of wearing one at a game is that the formerly anonymous Nation members are introducing themselves. The virtual community is growing more actual. Dang, I didn't read this before I went to the game on Friday so missed you. Any chance you will have them at the game today? I see in the basketball forum that you have a surplus of shirts...I was going to comment there, but you have locked that topic, so I will comment here. I think you should partner with a good friend off the Pilots...maybe make a package deal. There are still some S, M & L sizes left of the current version... please let me know ASAP if you are interested in buying one (soon to be a collector's item, i'm sure). Now that the logistics have been mostly cleared in producing these shirts, it is much easier to design and have them printed. Another design I had considered was quite similar to the current version, except with the "Portland" text across the front chest, and the "P" logo centered beneath it (or down towards the bottom to one side), and then the same text on the back. But your general thoughts are requested... what color shirt and print? design? ringer tees? v-neck? use the pale gold (or other) accent color? sweatshirts/hoodies? track jackets? hats? Beer steins? Lose the official logos altogether and be more creative? More artsy? I did check into special-ordering shirts that are the official UP "purple", which is a darker shade than the current shirts... unfortunately you have to order huge quantities to make that work. I've been happy with the current shade. It is darker than some UP shirts out there and, quite frankly, I'm not a fan of a lighter "lavender" shade of purple. The current purple is fine. I was never that crazy about the accent gold and now you don't really see it anymore. I think it's pretty cool of the university to let you use the official logo and font while still being able to keep the cost to you and us reasonable. I think we should do PilotNation "wife-beaters" or sleeveless-tank-top-like undershirts if you are easily offended by the name of an undergarment. I'm all for a retro T that doesn't cost $38, but yes a ribbed sleveless tank undershirt would be pretty sharp for showing my Purple Pride while at the same time giving everyone else a ticket to the gun show. DaTruRochin wrote: I'm all for a retro T that doesn't cost $38, but yes a ribbed sleveless tank undershirt would be pretty sharp for showing my Purple Pride while at the same time giving everyone else a ticket to the gun show. Will you be rocking it if you make it to Season 2 of Jersey Shore? Would folks be interested in a PN T-shirt, Version 2.0? We could do something simple like we did last year (obviously mix up the text, color, etc) or we could look into doing something with more graphics on it.... thoughts?